Microsoft Outlook/Exchange has integrated email, calendar and contacts. 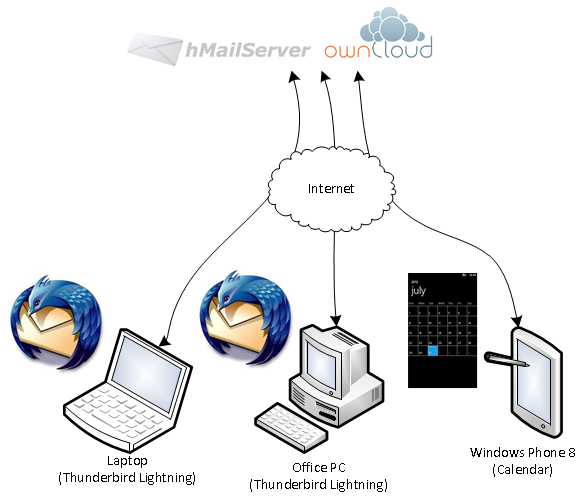 To have such functionality in other email and calendar programs you use the IMAP/SMTP (email), CalDAV (Calendar) and CardDAV (Contacts) protocols. Usually configuring email is pretty straightforward on different devices and with different email clients. However, contacts and calendar can give some challenges especially when timezones and Daylight Saving Time is involved. There is no direct support for adding a CalDAV and CardDAV based calender to your Windows Phone 8. The workaround is to (mis-)use the Google profile for this. Read here the detailed description on how to configure WP8 with your own CalDAV and CardDAV server. Using the Google profile for CalDAV and CardDAV is broken in WP8.1. Now add an iCloud profile. 1. Add an iCloud account using fake credentials. This will get you an authentication error but the account is added anyway. 2. Configure the server URL to point to your CalDAV/DardDav server. This where things get muddy. When you open a WP8 created appointment in Thunderbird Lightning, the times are shown correct! It seems that Thunderbird Lightning has some time interpretation problem. To make a long story short, WP8 is using a certain string for a timezone, in my case:"W. European Standard Time". Thunderbird uses "Europe/Amsterdam" for the same timezone and was not able to map the WP8 timezone to something sensible. The ownCloud server was able to make that mapping and presented the appointment correct so the problem was somewhere in Thunderbird. Browsing the timezone database with SQLite Browser showed the "Europe/Amsterdam" record. To solve the display problem we added a record to the timezone database with the "W. European Standard Time" as the key and the properties of "Europe/Amsterdam". Now Thunderbird Lighting day or week view shows the appointment at the correct time. The underlying problem was the way the Microsoft was dealing with timezone names. Reading more shows that timezones naming and translating is a mess. For more information about timezones read here and here. #1: Use Thunderbird Lightning 2.6.4 or higher. Older versions do not sync well. #2: Modify the geo codes to be different to "Europe/Amsterdam", e.g. by adding 1. Else Thunderbird is not showing "Europe/Amsterdam" in the timezone configuration anymore.